Batter: banana + chopped langka (jackfruit). Buttercream frosting: brown sugar + langka syrup. Topping: strips of fried eggroll wrapper with brown sugar + chopped langka. Being Filipino, I grew up loving Turon (a traditional Filipino dessert fried eggroll filled with sliced plantains, jackfruit (aka langka) and drizzled with sugar). It is absolutely delicious. 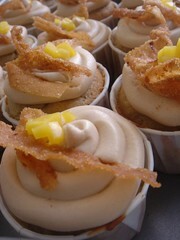 I would love to try this cupcake recipe on my bakery customers and see how it goes over! If it goes well, I just might add it to my cupcake menu. Thanks for this great dessert idea! I'm half Filipino myself and these sound delicious! I love Turon!